After Toby (Feed Me) and Karthik (Feed Me Too) added RSS feeds to their sites, it was only a matter of time till I added one to VarunAbhiram.com. Yesterday I was bored doing absolutely nothing all day, so I ended up adding it! Look for the little orange RSS icon in the navigation on the left. Karthik’s post has a detailed write-up of what RSS is and how to go about adding a feed to your website, so I won’t repeat all that here again. If you’d like to subscribe to the RSS feed at VarunAbhiram.com, or this blog for that matter, use an aggregator like Google Reader. 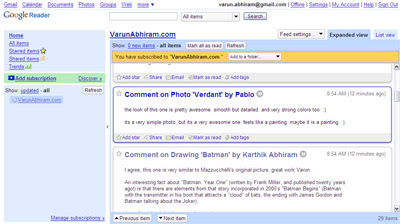 All you need to do is to add your subscription (Eg: http://varunabhiram.com/rss is the subscription link for VarunAbhiram.com) there. With this, I think I’ve added all the features I can think of to the site. Now all that remains is updating the content — that’s one area I’ve been neglecting for a long time.